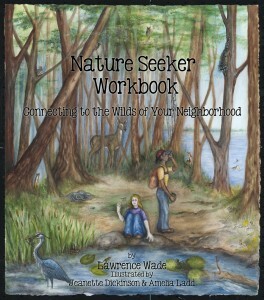 Download the Midwestern Fish Activity. Answer the questions using the text below. Click here for the PDF. Bluegill and pumpkinseed are two closely related pan fish. Bluegill is the most common pan fish in Minnesota. The bluegill gets its name from the blue coloring at the tip of its gill flap. 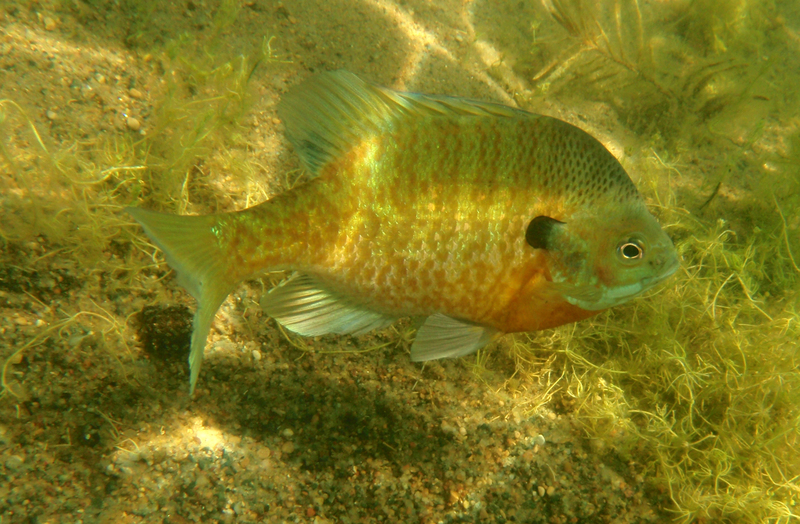 The pumpkinseed closely resembles the bluegill except for the bright orange spot at the tip of its gill flap. Both types of fish feed on various species of small minnows, aquatic insects, snails, and weeds. 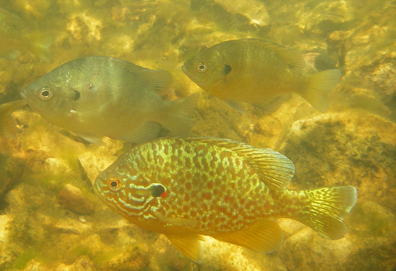 Bluegill and pumpkinseed spawn (lay eggs) in May and June. As many as 50 nests can be found in one colony. A male chooses a shallow water bay with a sandy bottom for its nest. It clears a depression in the bottom for a nest (two feet across) and waits for a female to enter the spawning area. A female bluegill will lay up to 60,000 eggs. After the fertilized eggs are laid, the male chases the female away and guards the eggs. The male will continue to protect young frys after they hatch. Often the best place to find bluegill and pumpkinseed is at the edge of a submerged weed bed. In many lakes the population of bluegill is so high that the fish are stunted (average 4 oz). In lakes that contain a better balance of predatory fish, the average bluegill is 8 oz and gets up to 2 pounds for a large fish. The state record for a bluegill is two pounds, 13 ounces. 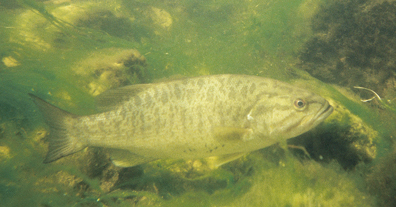 The largemouth bass is bullet-shaped and has a horizontal stripe on the side of its body. 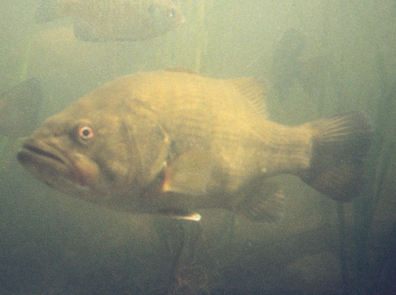 The largemouth thrives in clear water lakes that have substantial weed beds. A weed bed can provide cover for a bass, produce food for the bass and for the fishes they feed upon. Bass spawn in May and June when the water temperature reaches 60°. The spawning beds are found in sheltered bays in shallow water (2-6 ft deep). 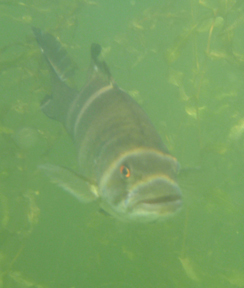 Bass build their nests at least 30 feet apart from other bass and establish territories. During the time that the males guard the nest, and do not feed during this time. The average count is 4,000 fry (newly hatched fish) per nest. A three pound female may lay up to 40,000 eggs. Largemouth feed in the early morning and late afternoon in shallow weedy lake margins.They are least active at midday. Bass feed on perch, minnows, small sunfish, crayfish and frogs. Bass will even eat a mouse if it falls into the water. The Minnesota state record for largemouth bass is 10 pounds 2 oz. Smallmouth bass are also called “bronzebacks” because of the brownish coloration. They got their name because their mouth is slightly smaller than a largemouth bass. The smallmouths I have seen diving are more curious than most fish. I have had several come right up to me. 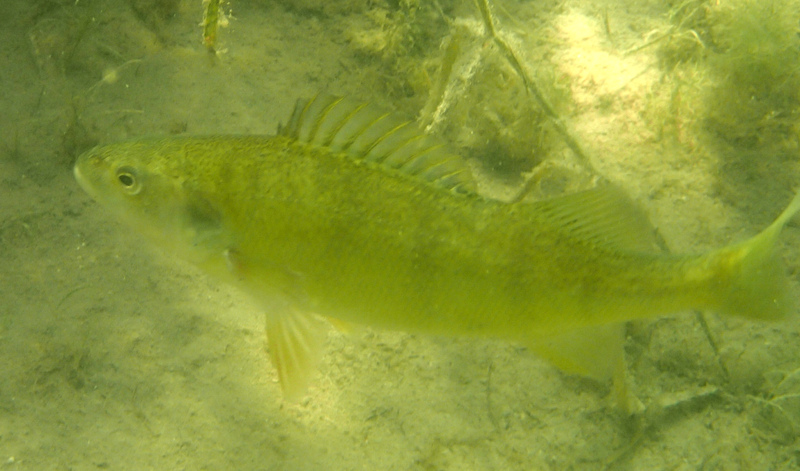 Most smallmouths caught are two to four pounds in size and live up to 10 years. Smallmouth bass are known to be one of the strongest fish for its weight. The record smallmouth caught in Minnesota weighed eight pounds. 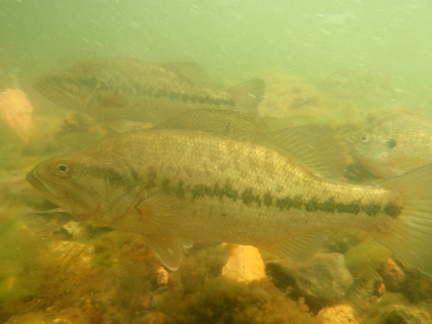 The spawning habits of the smallmouth bass are very simililar to the spawning of its cousin, the largemouth bass. Smallmouth bass eat crayfish, sunfish, yellow perch and other small game fish. They are one of the top game fish caught in Minnesota. Fisherman know that the northern pike is a tremendous fighter, and pound for pound must rank near the top of the list for freshwater game fish. It has a long streamlined body that is specialized for short bursts of speed. It is well camouflaged with its bluish green coloration. Many pike that I have approached when diving will remain in the weeds, not moving. Pike may reach a very large size of 25-30 pounds. The Minnesota State record for northern pike is 45 pounds 12 oz. Pike grow 10-12 inches in their first year. A 36 inch specimen was found to be nine years old. A pike may live up to 25 years. 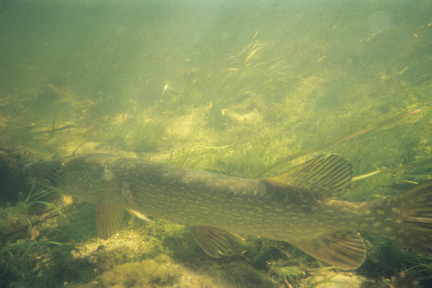 Pike are usually found in the shallows in weeds. However, during the month of August, when the water is warm, they move into deeper, cooler waters. Northern pike is primarily a sight feeder. It waits for its prey in the weed bed. Then darts out with lightning speed and seizes its prey. They feed on minnows, sunfish, perch and suckers. Pike will even catch small muskrats and ducklings. In midsummer, they feed almost exclusively on the large numbers of leeches that are found in shallow water. During the summer, they feed in shallow water in the morning but move into deeper water by late evening. Pike spawn immediately after the ice melts in April. 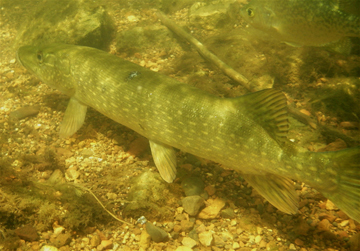 Pike use small streams or the edges of lakes to lay their eggs. A five pound female may have 60,000 eggs. Young pike feed on zooplankton such as daphnia and copepods. “Muskie” or muskellunge are the largest fish in Upper Midwest. The state record for a muskie is a 56 inch long fish that weighed 54 pounds. When feeding, muskies wait in the weeds and lunge with lightning speed at their prey. Or they may stalk prey by “finning” slowly towards a fish and then lunge as fast as the eye can see. One slash is enough to sever the tail of its prey. Muskies eat primarily perch and suckers, but will strike anything that moves. They have also been known to take ducklings and muskrats. Since muskies are the at the top of the food chain, they tend to have a higher level of toxic chemicals in their bodies (PCBs, pesticides and mercury). They feed on smaller fish that have less toxicity, but the chemicals do not break down and are stored in a muskie’s body. Over time, the toxicity increases and is harmful to muskies and humans who eat them. It takes a female 14-17 years to reach 30 pounds in size and muskies may live up to 30 years. If you catch a trophy sized muskie, it is important to release the fish so that it can continue to reproduce. 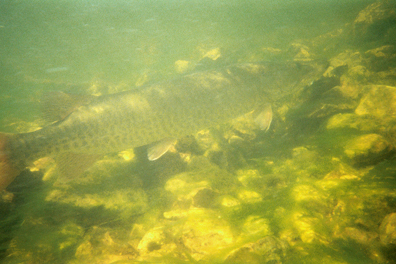 A large female muskie will lay up to 100,000 eggs. A sterile hybrid of the northern pike and the muskie is the “tiger muskie” and is stocked in several heavily fished lakes in the Twin Cities metro region. The walleye is the Minnesota state fish. It is an excellent eating fish and is the most sought-after fish in our state. The walleye looks blind because of its glassy eyes. It is these eyes that allow a walleye to feed at night in murky water. Walleyes grow relatively fast, reaching about a pound at three years of age. Walleyes grow to 26 inches and weigh up to 15 pounds. The state record is 17 pounds 8 ounces. By Examining walleye ear bones, scientists have been able to determine that they live more than 20 years. Walleyes spawn in early spring, just after the ice has melted and are very active during this time of the year. They migrate into small streams where females lay their eggs in gravel beds. In lakes without an inlet, they move into shallow rocky areas near shore, 1-5 feet in depth. They usually spawn at night. Walleyes lay their eggs on the bottom and leave, while males fertilize the eggs for several nights. Larval walleyes feed on zooplankton, but as they grow in size they begin feeding on their favorite foods, minnows and yellow perch. In the spring at night, walleye swim into shallow water and feed, then at sunrise move back into deeper water. In July and August, walleye are found deeper as the water temperature increases. Even up to the age of three, Walleyes are preyed upon by muskie, pike, and largemouth bass. But the largest predator on walleye are humans, over 3 million are caught each year by fisherman. To ensure that walleyes are not over fished, the DNR protects habitat, limits the catch and stocks walleyes when necessary. There are two types of crappie in Minnesota, the black crappie and white crappie. The black is the most common.The body shape of a black crappie is flat and roundish. The color is silvery with numerous black splotches along the side. Crappies are smaller fish, but get up to 12 inches in eight years. Crappies mature early, sometimes spawning in the first year. A two pound female may lay as many as 140,000 eggs. Crappies spawn in May and June. They often nest on muddy bottoms close together in shallow water (three-six feet deep). If crappies become too abundant, the lake may become overcrowded with stunted crappies. 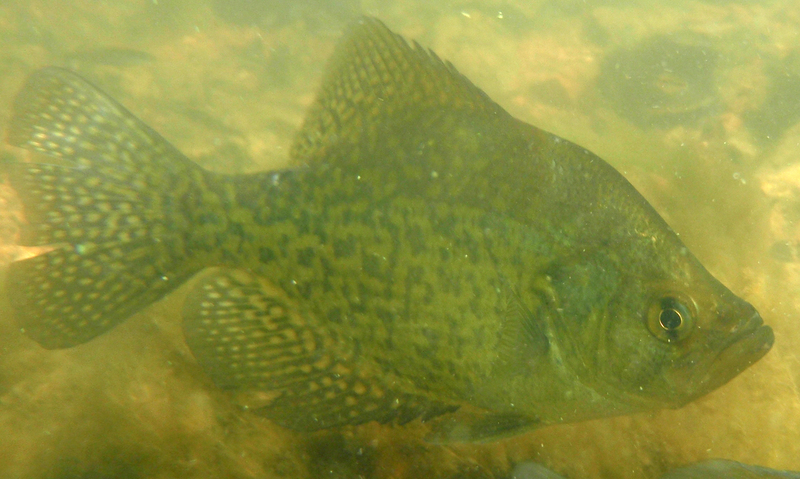 Crappies feed on insects, crayfish, minnows and other small fish. The deep part of weed beds and the outer edges of the weed beds are their favorite feeding areas. 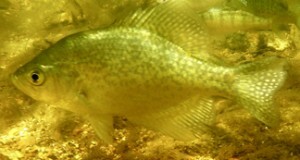 In the winter, crappies are more active than most other fish, feeding on small fish and insects throughout the winter. In early spring their favorite foods are zooplankton, such as daphnia and copepods. The state record for black crappie is five pounds. Yellow perch are usually not over 10 inches long. Their sides are yellowish/green with 6-9 vertical bars on the side of the body. Perch feed on minnows, crayfish, leeches, and snails. They are usually found in small schools with fish the same size. 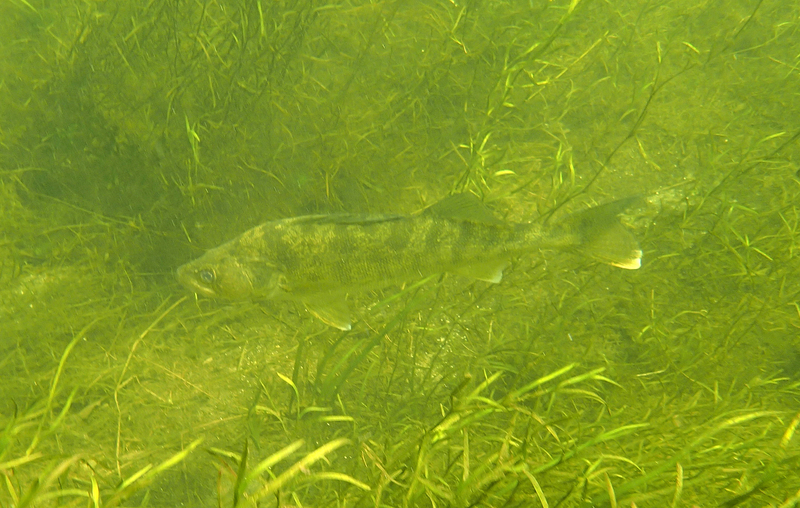 During the day, perch are found in shallow water in weed beds. In early evening they feed in open water on minnows. At night, they rest in the weeds in shallow water. Perch spawn in mid May, placing jelly-like ribbons on sticks and weeds. A single female may lay up to 50,000 eggs. 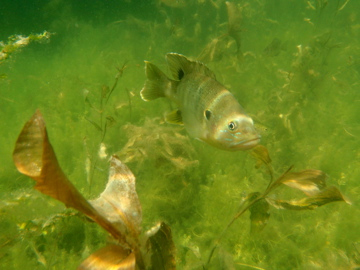 If the eggs and frys are not eaten by predators, perch will virtually take over the lake, so that no other fish can live there. Cooked perch is as good as walleye, but fisherpeople don’t like to eat them because they often have many parasites. However, if the perch is cooked properly the parasites are killed. 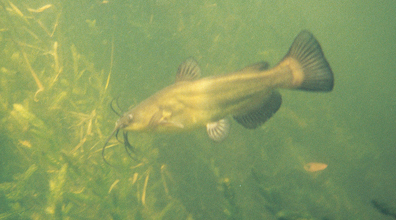 The brown bullhead is in the catfish family. The name catfish comes from the long barbels on the fish’s head. The barbels contain taste buds and help the catfish detect food in the water. Bullheads should be handled carefully because they have a sharp spine beside their dorsal fin (top fin) and pectoral fins (on the side). These spines have a mild venom which can be released if the skin is punctured. Bullheads are scavengers, eating just about anything including: plants, insects, frogs, crayfish, and small fish. Bullheads spawn in the spring. In early summer you can find large schools of young bullheads in shallow quiet waters. Both adults remain with the school protecting them for two weeks. The bowfin or dogfish is an ancient fish which has existed since the time of the dinosaurs. It has many of the characteristics of the earliest fishes that appeared on earth some 450 million years ago. 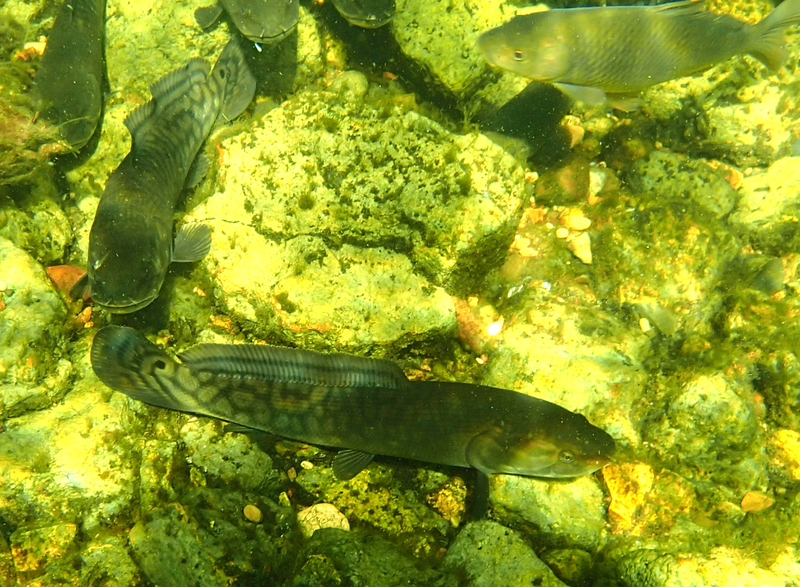 Bowfin can live in water that is very low in oxygen. I have seen bowfins survive a Minnesota winter by maintaining a breathing hole. Bowfins left out of water in cold temperature can survive for 24 hours without harm. One bowfin left in an aquarium,without food, was discovered a year later, still alive. It has powerful jaws with many teeth and feeds on all kinds of fish. Bowfins are considered destructive to game fish and somewhat of a pest. Carp can reach 30 pounds or more. The record carp is 55 pounds, 5 ounces. I have seen a large carp in Christmas Lake, Minnetonka, that resembles a big sea bass. Carp have big-scales and appear gray with orange pectoral and dorsal fins. Carp are native to Asia and were introduced in Minnesota in the late 1800s. It is regarded as one of the most important freshwater fishes in the world, furnishing high-protein to millions of people in Asia and Europe. However, the carp in Minnesota is regarded as a “trash” fish. They are not popular in this state because they destroy vegetation; ruin spawning beds of native fish; and cause clear lakes to become murky. The DNR has a program for reducing carp populations by trapping them. But carp have continued to spread throughout southern Minnesota lakes and rivers. The only natural predator on young carp are predatory fish like walleye and northern pike. During spawning in May, I have seen up to a 1000 carp crowded into small bays on Lake Minnetonka. A female carp will produce over 2 million eggs. Carp uproot underwater plants, and feed on tender shoots. When a carp is feeding along the shore, the plants are mowed down one after another. The water becomes cloudy with stirred up mud and affects the water quality of the lake. 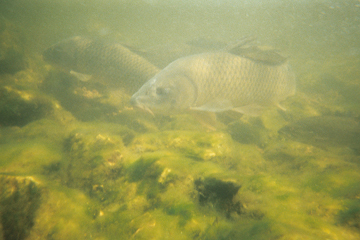 Sunfish and bass spawning beds can be covered up by the silt created by carp. Carp are very abundant in some shallow lakes. In winters where there is an abundance of snow, underwater plants are not able to create oxygen. In many shallow lakes the oxygen gets used up and hundreds of tons of carp die. While diving in areas where there is a concentration of carp, they are usually very skittish. But I have had them come up to me and rub against me, sort of like a dog. Also, they have big eyes, and remind me of a cow underwater. Eddy and Underhill. Northern Fishes. Minneapolis: University of Minnesota Press, 1974. Phillips and Schmid. Fishes of the Minnesota Region. Minneapolis: University of Minnesota Press,1982. Dear Sirs, I have lived on Lake Vermilion for 45 years and as for the Muskies , no one asked any of the people who resided at the time that they were going to stock the lake with these fish. I feel and so do a lot of the people that actually live on the lake that they should have never allowed these fish on this lake. There is no walleye any more and for the northern pike it is very hard to actually catch any small fish too. There was a time I could get 2 or 3 walleye right off our dock and then because of all the boats and Muskies the walleye are no longer even in our bay. It is to bad that a large lake like Vermilion which was a family enjoyment lake at one point can turn into a non sociable or a unwelcomed lake that it has become.